McDonalds Australia is running “Anything for Love”, a TV commercial featuring the 1993 Meatloaf hit, “I’d do anything for love”. The 90 second commercial tells the story of a young man’s journey from a self-centred bachelor to a dedicated dad. From the moment she’s born there’s nothing he wouldn’t do for her until one day, in her favourite restaurant, he finally draws the line. 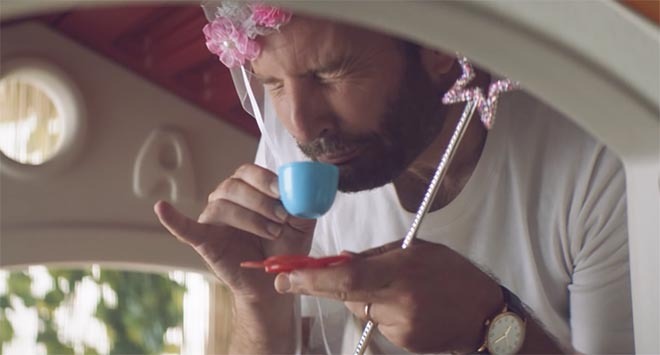 The McDonalds Anything For Love commercial is latest in the McDonalds Create Your Taste campaign, reminding customers that adult tastes are catered for in the new designer burger options with “grown-up ingredients”. The McDonalds Anything For Love commercial was developed at DDB Sydney by chief creative officer Toby Talbot, creative partner Steve Jackson, creative team Richard Apps, Jeff Galbraith, Anna Paine, Owen Bryson, senior broadcast producer Jacqui Gillies, managing director Nicole Taylor, group account director Lisa Hauptmann, account director Lisa Little-Cain, chief strategy officer Fran Clayton and planning director Anna Bollinger working with McDonalds Australia senior marketing director Bronwyn Powell, marketing director Jo Feeney and senior brand manager Anna Webster. Filming was shot by director Noah Marshall via The Sweet Shop with director of photography John Toon, producer Tony Whyman, executive producer Edward Pontifex and managing director Wilf Sweetland. Editor was Tim Mauger at The Butchery. Colourist was Ben Eagleton at BE Colour. Post production was done at Fin Design. Sound was designed by Simon Lister at Nylon Studios. Music, “I’d Do Anything For Love”, performed by Meatloaf and composed by Jim Steinman, was supervised by Karl Richter at Level Two Music.